Uncategorized | "What's Cookin', Mamele?" “Tradition!” Tevye the Milkman sings in Fiddler on the Roof. What did he mean? Mostly, he was referring to an adherence to the Orthodox traditions of his small Russian village, but I’d like to think he could have also been singing about food. It seems like winter sort of just begs for traditional comfort foods, doesn’t it? Traditional foods is a phrase with several meanings to me. The historian in me recognizes traditional foods as those foods indigenous to a particular place or time. The average person in me thinks of a wide assortment of foods from the many influences which make up my background and which at some point or another were considered ‘traditional’ in my childhood home. We usually had cinnamon rolls on Christmas morning; family gatherings always included guacamole and probably enchiladas; summer meant grilled chicken (or BBQ since Californians aren’t so picky about what constitutes actual BBQ); and our mac’n’cheese used to come with cut up hot dogs in it. Then we moved around…a lot. I learned that it isn’t a party in Indiana without a slow cooker full of meatballs; sweet tea is not the default in eastern Missouri north of about Perryville; BBQ does not mean chicken on a grill in North or South Carolina; and I do not like collard greens (even though everyone swears I’d love them if only I had So-and-So’s collards). Since embarking on my journeys into parenthood and Judaism, I’ve also learned even more about traditional foods. I’ve learned that as a parent, there is always room for new traditions. This is especially true when integrating you and your spouse/partner’s traditions into one family set of traditions. I have also learned that taking traditional foods (such as traditional Jewish yom tov dishes) and making them your own can be one of the most rewarding and deep ways to connect to a new tradition. So, I’ve made my own version of savory hamantaschen, kheema kreplach, and a savory onion kugel. Sometimes it’s nice to stick to bubbe’s recipes, but sometimes your own spin on something can be even more delicious and meaningful. I finely diced one sweet onion, five peeled carrots, and five stalks of celery. 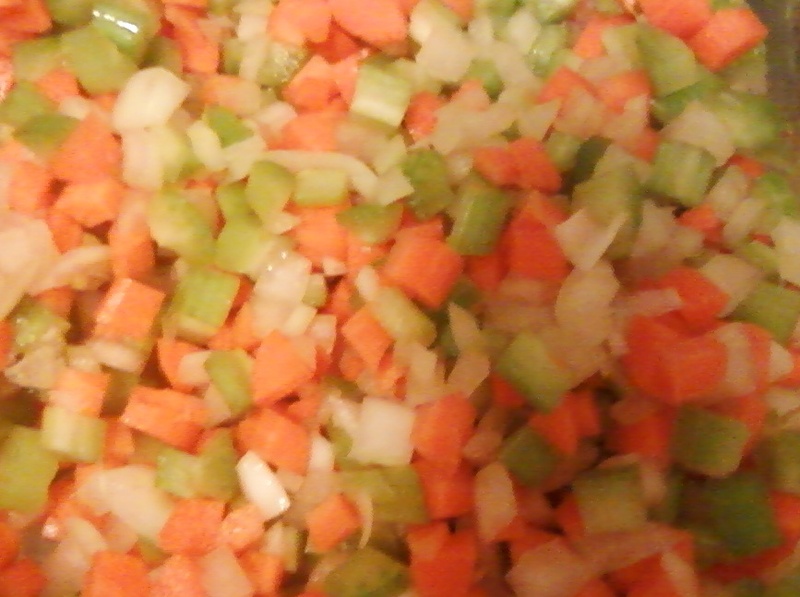 This is the standard mirepoix used for many soups and stews – I did a fine dice to make it easier for my toddler to eat but you could leave things chunky. In a large pot, I then heated 2tbsp olive oil on medium heat. I tossed in the mirepoix, 1tsp salt, 1/2tsp pepper, and 1/2tsp hot paprika (I can’t make soup/stew without the stuff), 2 cloves minced garlic, and cooked the vegetables until tender. Then, I scooped out the vegetables into my slow cooker. I cubed my pot roast meat into about 1/2″ chunks and tossed them in some all-purpose flour. In the large pot on the stove, I added a splash more oil and returned the heat to medium before adding the flour-coated beef. I added about 1/4tsp more kosher salt to the meat while it browned to be sure I was seasoning every layer (you must season every layer of a soup/stew or it will be bland, yuck). Once the meat was brown on all sides, I added it to the slow cooker with the mirepoix. I then poured 3 cups of beef stock into the slow cooker and turned it to high heat. Since the beef stock didn’t fill the slow cooker and I didn’t want to overdo the salt, I topped off (almost) the slow cooker with 3 cups water. Now here’s the ‘secret-make-it-delicious-part.’ You should saute the cabbage before you add it to the stew. In the same pot I cooked the mirepoix and meat in, I heated one more teaspoon of oil and added in 1/2 head of cabbage cut into quarter shreds, 1/4tsp salt, and 1/8tsp paprika. 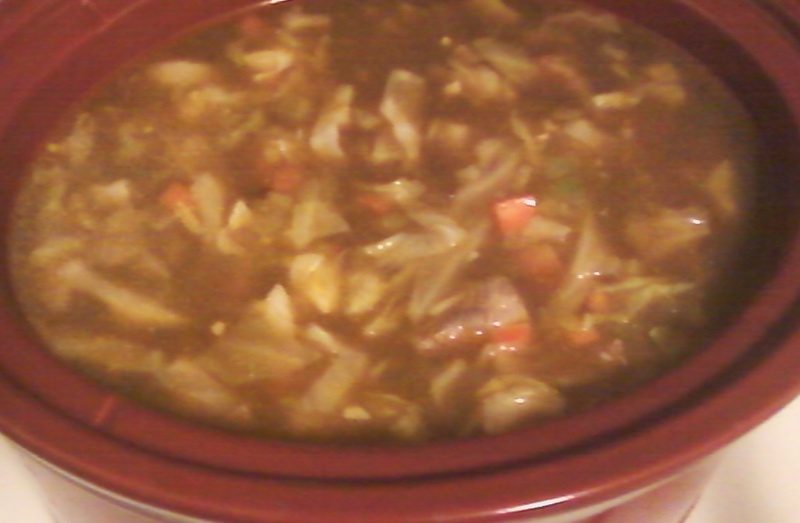 The cabbage cooked down until soft and then I dumped it into the slow cooker too. The basic stew was done and just needed to simmer to marry the flavors at that point. But wait! How could this stew be even better? With dumplings obviously. I prefer a fluffy simple dumpling in my beef stews, so I whisked together 2 cups flour, 4tsp baking powder, 1tsp salt, and then added 1 cup water to make a sticky dough. Using a big spoon, I dropped the dough onto the bubbling stew about 25 minutes before we were ready to eat. My slow cooker lid wouldn’t fit back on with the dumplings puffing up, so I made a tented lid out of some foil and let them steam away on top of the bubbling stew until no longer doughy. This was a huge hit with everyone. My husband couldn’t get enough and my son said ‘soup’ for the first time because he liked it so much (he ate 2 toddler-sized bowls!). I told my husband I’d have to do this post if for no other reason than the fact that I want buckets of this stuff instead of hospital food when I go into labor, and he needs to be able to make it. Yes, it is that good. I had an all-butter frozen pie crust sitting in my freezer for longer than I care to admit. Really, it’s astonishing that a pie crust lasted that long without being used around here at all. But, I digress. While I love sweet pies and have a father whose favorite food on earth is apple pie, I really really enjoy a good savory pie. There’s something about a slightly sweet and buttery crust with a slightly salty and savory filling that hits me just right, especially in cooler weather like we’re having now. 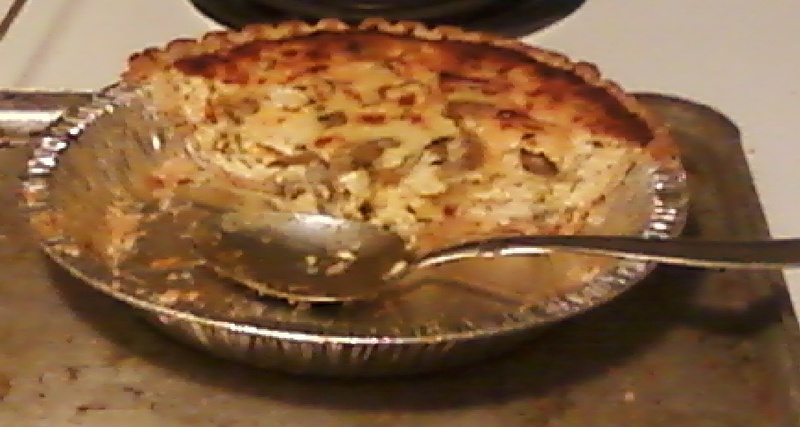 Below is a super easy recipe for a cheese and mushroom pie which I served with some panko-crusted white fish recently. Sauté mushrooms and garlic in butter with salt and pepper over medium heat. In the meantime, mix cheeses and eggs well in a medium bowl. Once mushrooms are soft, add mushrooms and garlic to cheese mixture and mix well. Be sure to avoid adding any excess liquid from the mushrooms to the cheese mixture. Spoon mixture into pie crust and bake at 375 degrees until center is set and top is golden (30-40 minutes).